Most builders and contractors invest in marble flooring because it not only increases the property value in a build, it’s also the most durable material when installing interior finishings. Marble is a natural stone, strong enough to withstand the harshest conditions. Used as flooring, it won’t crack, tear, bend, or scratch—unless it’s under natural catastrophic circumstances. Even then, marble has been known to hold up relatively well. Unlike vinyl, carpet, and hard wood, marble has proven to stand the test of time throughout the ages, in art and architecture, it is still admired to this very day. To have marble flooring installed into a build is considered quite a treasure and buyers are usually willing to pay top dollar for such upgrades. While most marble sellers will rave about how beautiful this material will look in offices and residential builds, what most won’t tell you is how to care for it. There’s seems to be some kind of myth about marble floors not needing much care and maintenance. While marble is a durable stone, like anything else in a construction build, especially the interior, it requires a certain amount of care and maintenance. First things first! You must prepare your floors for cleaning. In short, you have to clean your floors in order to clean them! Think of it this way: before mopping your floors, you sweep them with a broom, right? It’s the same concept for cleaning marble floors. There needs to be a preliminary cleaning that does away with the more obvious dust particles, debris, and dust balls that brush across the floor. The last thing you want to do is place a damp cloth on a dusty marble surface. You’re most likely going to just push wet dirt around this way. It’s very important to remember that you’re treating marble, not granite. There is a difference between the two natural stones, although they often get mixed up. Marble cannot be treated the same way as granite because marble is a much softer stone. While it attains its durable resilience, marble’s softer properties make it easier to stain if not pre-treated properly. We’ll get in to how to pre-treat your marble floors later, but first it’s important to get a basic understanding of how to clean your marble floors. Because marble is a bit easier to stain, there are certain cleaning products that you should absolutely stay away from. While many of us have been used to cleaning with bleach, ammonia, and abrasive substances, all of these cleaning products aren’t necessary when it comes to marble floors. Even vinegar, something that is considered somewhat of a natural cleaning agent, is prohibited. In fact, any acidic substance—natural or manufactured is not suggested for cleaning marble surfaces. This realization often leaves people at a stand-still—not knowing what to clean their beautiful marble floors with, but the answer is fairly simple: soap and water. That’s it! One thing to remember when dealing with natural materials is that they’re natural—meaning they didn’t require any manufacturing. In such cases like this, the simple approach tends to be the best choice. Since marble can’t absorb dirt like carpet, a quick brush-over with a dry cloth will help keep the dust balls away, if done on a daily basis. For a more thorough cleaning, remember to use a warm damp cloth using a mild soap. It can be argued that if marble is such a fantastic natural stone fit for interior builds, why is it necessary to protect them? The answer: Because if you want to retain marble’s natural look as if it were first installed, it’s absolutely necessary! Yes, marble has certainly proven itself to stand the test of time, but the exterior condition of some of these marble structures and works of art have taken on a different type of surface throughout the years—that is until the modern preservations began to have it’s influence. Prepare your marble floors for cleaning, and then clean them. Next, you’ll need to purchase a sealer from your local home improvement store or from Nalboor Tiles. When it comes to sealers, there are several options to choose from. The first way to narrow down your selection is to make sure that you’re choosing a sealer for marble flooring. There are different types of stone flooring sealers, so be sure to get the right one. The most basic kind of sealer is the 511 Penetrating Sealer Impregnator. It is designed to protect natural floors from medium to dense porous surfaces. It is good for interior and exterior use; it’s weather resistant, and good for food areas and U.V. transparent. Place your order for a pint of this sealer here to try it out! 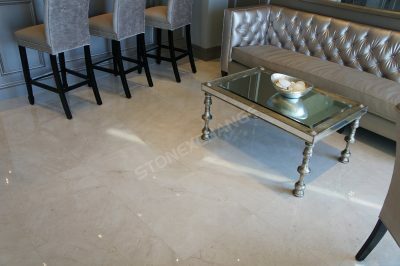 What Kind of Marble Floors to Get? View our full online inventory here. Do you have any questions regarding other options for marble sealers? Call Nalboor Tiles today, or contact us online and one of our customer service representatives will be more than happy to answer any questions you may have.